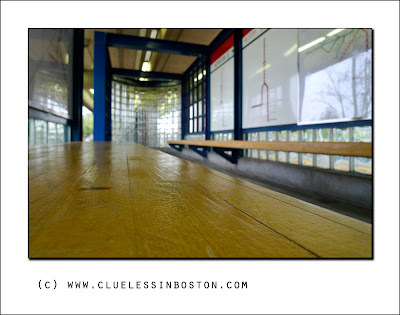 Bench at commuter train station. I know this picture doesn't have center of interest, but I liked the light and color, and the overall feel of the picture. It also would have made a good theme day post for the theme of empty. for the absence of people. Great lines and color. Happy 4th, clue. Challenging perspective! The bench looks like a very large dining table to me. well, here comes the photography police now, busting you for violation of photography code 128.9 - no center of interest. well, center of interest THIS: i think it's a WONDERFUL picture. and i was interested in the WHOLE THING. I agree with ennbee. This is a little gem hybrid of a shot bordering on the abstract. It's excellent. I always like these kind of shots, especially if you can set up a mind battle by having something in the foreground that keeps your focus yet converging lines into the distance that want to draw your eyes away from it. COuld be hanging in the MoMa. What strikes me is how clean it is. Happy 4th of July! Light, colors, lines, what more? You got it right - it's the light and color that make it, but also the composition that draws your eye off into what appears to be a glass infinity! Hey Mr. Clueless, I just watched the Boston Pops 4th of July special on tv. Lucky you to be there! What a superb fireworks display this year!